It will take a lot longer than 24 hours to see and experience everything New Zealand's capital has to offer! A city steeped in history, surrounded by natural beauty, serviced by the latest technology and buzzing with good vibes, Wellington lends itself to all travel tastes. From star gazing at the Carter Observatory, to slow walks in the botanical gardens or a night on the town, you'll be spoiled for choice in this famously friendly city. Put on a comfy pair of running shoes, pack some water or coffee and take a walk through one of Wellington's most picturesque trails. The Southern Walkway leads you along the town belt from Oriental Bay, through the lush foliage to points high above the harbour - the perfect vantage point to appreciate the balance of natural beauty and cityscapes in Wellington. Get the most important meal of the day at the ever popular Astoria Cafe - one of Wellington's prime breakfast hot spots. The smell of scrambled eggs, pikelets and freshly roasted coffee beans steams across the busy streets, summoning hungry crowds every day... so it's best to get your order in early! The i-Site Visitors Centre is an excellent free source of information. Find out if any special events, shows and festivities are happening in Wellington. You'll also be able to book tickets for the ferry, accommodation and make inquiries about any of the sites you want to see. Get a head start to your trip and drop them an e-mail before you head off. The Wellington CitySights Bus bus tour is a fun and exciting way to familiarise yourself with the city, and get a taste of the main attractions. It's a hop on/ hop off service that lets you go as many times as you like during a full day. So if you decide to stay at Zealandia for an extra hour, you can always hop on the next bus (or the one after that) coming past. 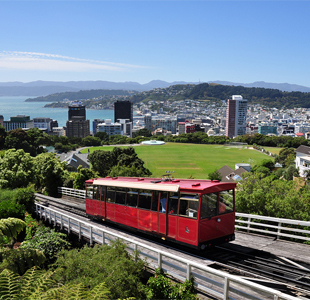 Combine two of Wellington's must see attractions by taking the famous cable car ride from Lambton Quay, high above the city and harbour, to the botanical gardens. The bird's eye view from your car's window is priceless. The botanical gardens look as if they are enchanted. 25 hectares of protected land, and an endless array of indigenous fauna and flora are there for you to go exploring. If that seems a bit daunting, you can just as well lie on the grass and appreciate the tranquility of the reserve. New Zealand's highly impressive national museum is a mind bending trip through world history, culture, science and art. There are some truly incredible 3D tours, displays and interactive activities. It is a free activity (except for selected tours) that is as fun and stimulating for kids as it is for their parents. This multiple award winning establishment offers magnificent views of the harbour, a first class setting, great wines and incredible food. It is the perfect place to treat yourself to VIP treatment and some of the freshest and finest seafood in New Zealand. Visit the stars and planets by taking a trip in the Carter Observatory's Planetarium. This state of the art facility also offers some incredible star gazing on Saturday nights (till 9:30pm). Located just above the Botanical Gardens, getting there is easy by car, bus or CitySights tour bus. When you get back to the city, treat yourself to some of New Zealand's most delicious gelato. The owners of Kafee Eis pride themselves in blending original Italian recipes with local produce. The result is a flavor bonanza. Cuba Street is the trendiest area in Wellington, comparable to Camden Town in London. There are interesting shops, tattoo parlors, bars, clothing stores and everything you wouldn't normally think of buying, but can't resist when you see it. The Weta Workshop is where film makers like Peter Jackson go to make fantasy a reality. This Oscar Award winning facility is the world leader in conceptual design and manufacturing. Take a trip to the visitor's center to see what goes into the creation and digitalising of figures like Golum and King Kong. There are also props, jewellery, make up, costume and armour displays not to be missed! 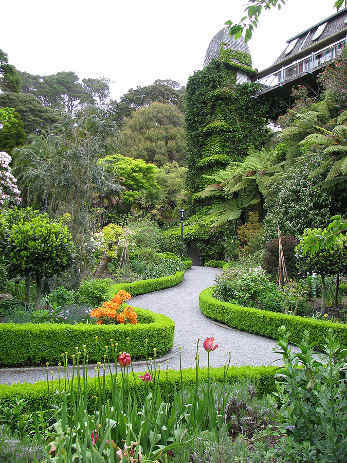 Zealandia is the world's first enclosed urban wildlife sanctuary. This incredible facility is home to some of the country's most endangered animals, and it aims to create an environment that predates human influence. The interactive exhibition is a great way to find out how and why the sanctuary started. Once the sun has gone down, take a guided moonlight tour of the area and experience its magic first hand. Please Note: Times differ according to the day of the week you book. Osteria del Toro is the perfect venue for great Mediterranean food, a fantastic selection of cocktails and excellent service. The relaxed atmosphere and incredible food make for easy dining or a great night out. End off a busy and exciting day by getting pampered by the team of trained experts at Body Haven. Detox, de-stress or de-jetlag - you can choose from the widest range of treatment packages to get you back on track. View the beautiful city of Wellington from high above its mesmerising lights and landforms. The exciting harbour tour takes 25 minutes and is perfect for couples and families. San Francisco Bath House is the live music epicenter of Wellington. Although its known as a rock venue, SFBH is becoming increasingly more genre friendly, hosting acts from across the board. Go online and check their regularly updated schedule for all the latest acts coming to town. Sandwiches is a unique live entertainment venue that specialises in hosting functions. Combining music with food and incredible facilities, Sandwiches is the kind of place where people can have a top class meal and dance the night away. With a fantastic menu and a ongoing flow of great DJ's and bands, you are guaranteed a great time. Shift gears a bit when you head to Alice, a bar that borrows its theme from the Lewis Carrol classic. Try a selection of drinks taken from the book and get a little Mad. Squeeze into a pair of bell bottoms, put on an afro wig (unless you are lucky enough to have one naturally) and head down to the most funky night club in Wellington. Boogie Wonderland holds disco theme parties every week, with resident and guest DJ's lighting the dance floor on fire with the best 70's tunes and remixes. Mingle with other like-minded travellers visiting Wellington, by popping in to the backpackers pub - the Basement. Located in Courtenay Place, it is right in the city centre, an arm's reach away from all the best clubs, pubs and all night restaurants. Walk to the top of Mount Victoria for the most incredible view of the harbour and city. If the city and harbour lights don't make a big enough impression, the star-filled sky certainly will. Whether you are still going from the night before, or find yourself up at the crack of dawn, the Establishment is one of the only pubs in Wellington with a 24 hour liquor licence. See if you're brave enough for a Bloody Mary that early or strong enough to keep going! Paraparaumu is a picturesque seaside town only 50 kms away from Wellington - perfect for a day trip. Make your way down there early for another full 24 hours of golf at the Links Course, a boat trip to Kapiti Islands or just a relaxing day away from the crowds. How Does Hiring A Car Work?